Eiriksvollen This DNT self-serve hut is quite nice and it even has a supply of food for sale. This is a convenient place to stay when climbing peaks in this general area. Here is a brief description in order to find the hut. First, locate the Hwy. bridge across the river. (Near the GPS location given below.) There is a small paved road that forks right very soon after you cross the bridge (assuming that you drive up the valley from Sunndalsøra, if coming down the valley from Oppdal, turn left before you enter the bridge. This road descends, then crosses under the main Hwy. Continue a short stretch and locate a possible parking on your left. The trailhead is a short distance further, there is parking off the road for one car at the trailhead. This trailhead has wooden trail signs, the location is N62.63298, E008.84285, elevation about 90 meter. From this trailhead, head uphill, slightly right, then turn left about half way up this first hill, the turn is marked with a wooden stick with red paint. Continue on this trail as it crosses a farmers field, then more uphill, slightly left. 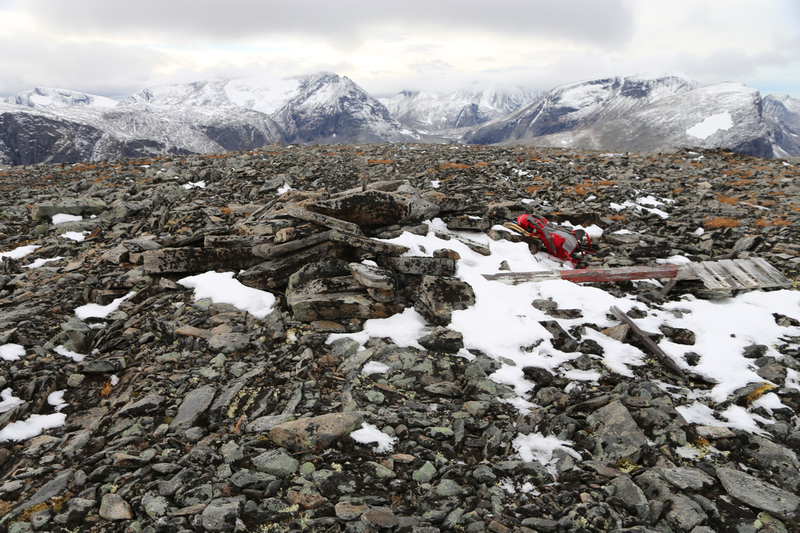 You will soon see the small gate and Eirksvollen located on a flat, nice plateau. It should take at most 10 minutes from the trailhead on the road below. From the Hwy. bridge, described above, continue towards Sunndalsøra. Pay close attention and locate a fairly good size (dirt) parking area on your left hand side. This location is N62.63337, E008.82028, elevation about 80 meter. Park here. From the parking, walk a very short stretch along the road (direction Sunndalsøra). Just after a small bridge, you should see trail signs as well as the trail going left. 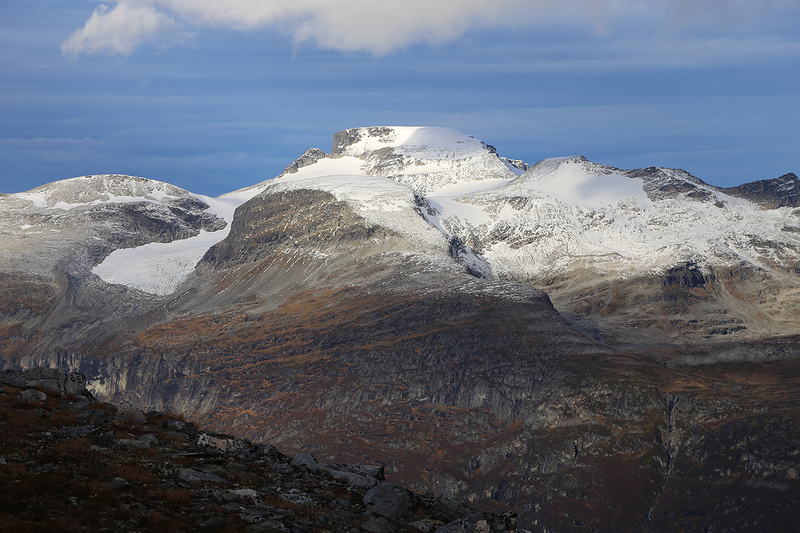 One sign reads "Konglehjellan", this is a well known view-point and the main trail leads there. Follow this rather large trail for about 20 minutes to reach the view-point. There is a trail register, a wooden bench and good views down the valley. A much smaller, but clearly visible trail heads uphill. This trail is marked with plastic tied to trees and branches, not very pretty. The trail soon steepens, you pass just below two cliff-bands, turning them on their right hand side. The trail then follows a small creek uphill, staying well on the left hand side (when looking uphill). This is indeed a pretty steep and somewhat relentless slope. You finally top out near location N62.62696, E008.79358, elevation about 830 meter. 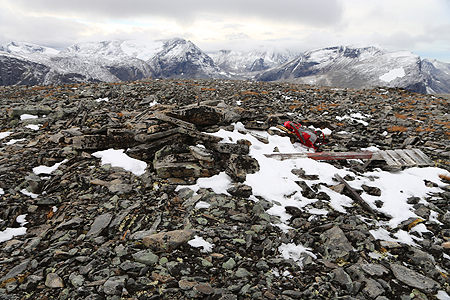 The trail becomes less well defined above this point, Continue uphill until arriving at a pretty flat area. The mountain forms a rather steep bowl higher up. Cross the creek here (good place to drink). Ascend the ridge that connects to higher terrain. There is a steeper section near the top, the terrain is easier if you stay a bit further right. Next, head uphill towards the peak. 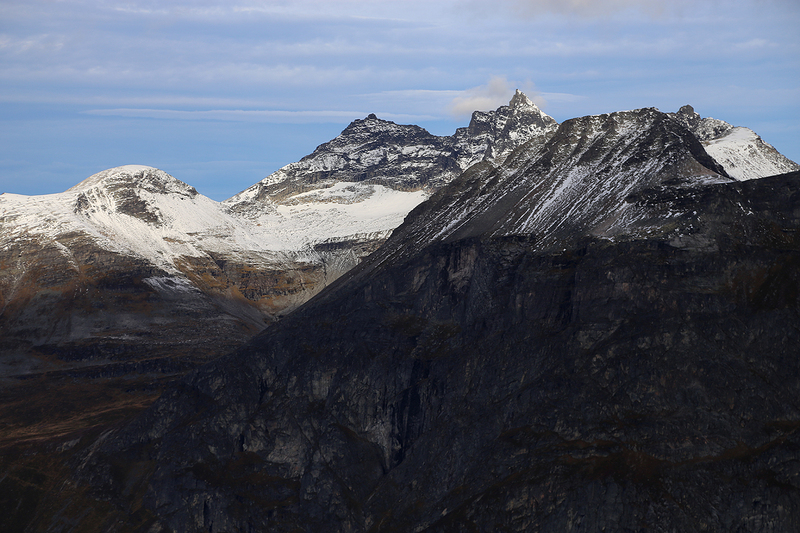 You will notice a fairly steep ice / snow patch higher up on the right hand side of the summit. The best route is to stay on the top of the ridge that ascends just right of this patch. Contour left as soon as the terrain permits. This will lead you nicely to the highest point. There is a fallen trig. marker and a small set of rocks (no real cairn) marking the summit. 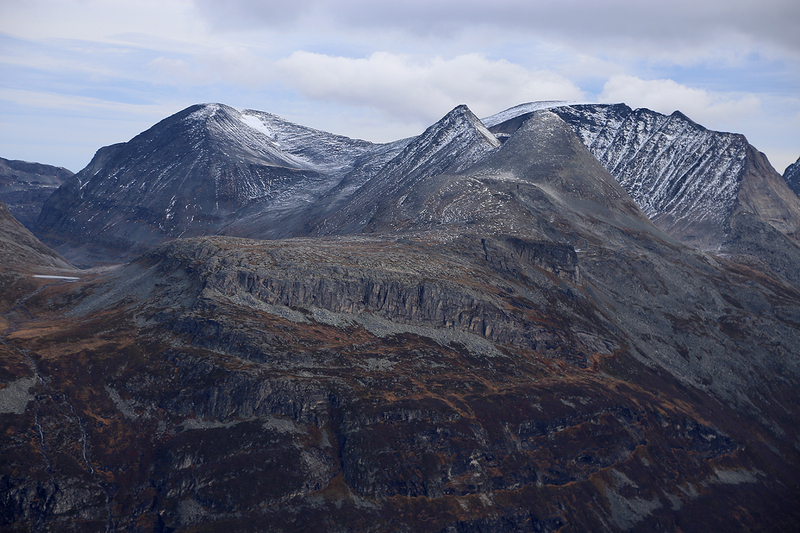 I had been to Lillehammer giving a mountaineering talk at the fall meeting of the local DNT-section. On Friday, I also tried to get our propan burner to work with the assistance of an expert from Bergen. Unfortunately, no luck with this. 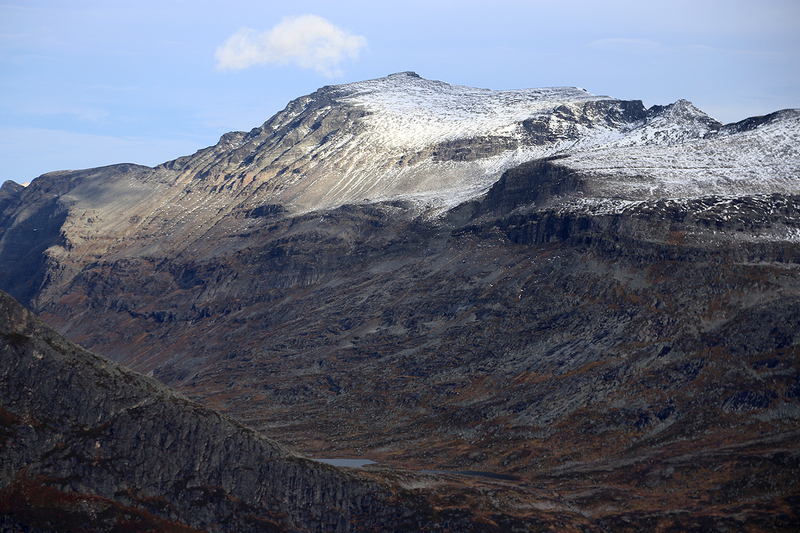 I next drove to Oppdal and turned towards Sunndalsøra. I stayed at Eiriksvollen, a very pretty hut. The next morning, I got up early and left for the trailhead. 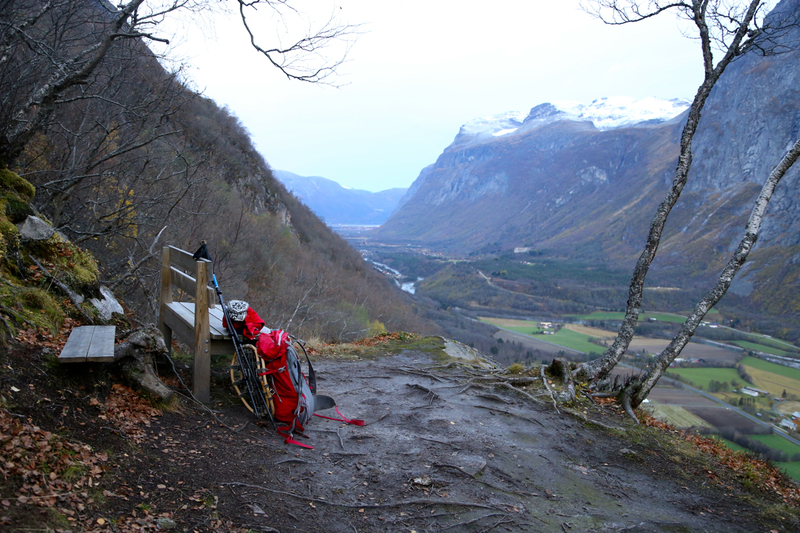 I left my car at 0715 and arrived at the view-point at the end of the nice trail in about 20 minutes. From here, much steeper, quite a long hill, arriving more or less on top around 0840. I continued uphill, but picked a ledge a bit too far to the right. This was a small detour and also got me into terrain where a bit of scrambling was called for. I arrived at a very windy summit by 1030. The view across the valley was very good. Store Trolla certainly called for some nice memories. However, this was not a nice place to rest today. The wind was strong enough to push me around. I descended around 1045. Picking a better route soon got me back down to the creek where a shart rest was in order. I continued down the steepish trail and noted a few people at the view-point. The rest was easy and I arrived back to my car at 1335. Panorama view across the valley, continued. Panorama looking west, Storkalkinn and more.